The agreement was initiated with the aim of having solidarity with other countries in accordance with ALBA. The payment system allows for purchase of oil at market value for 5%-50% up front with a grace period of one to two years; the remainder can be paid through a 17-25 year financing agreement with 1% interest if oil prices are above US$40 per barrel. The agreement builds on payment terms from the San Jose Agreement and the Caracas Energy Accord. Energy and Petroleum Minister and President of PDVSA Rafael Ramírez said of the deal that it seeks to cut out the middleman in such transactions: "We're not talking about discounts...We're talking about financial facilities, direct deliveries of products, [and] infrastructure." 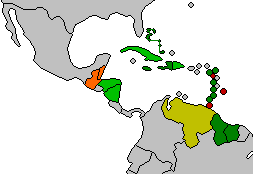 Haiti had not been initially invited to the talks, since Venezuela did not recognize its then post-Jean-Bertrand Aristide government. 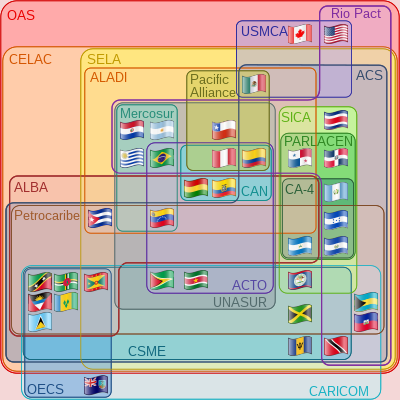 However, Hugo Chavez actively "courted" newly elected president René Préval took office, much to Chevron, Exxon, and the US State Department's chagrin. After Venezuela had invested in developing Haitian infrastructure, and after the Haitian government convinced Chevron to deliver the oil from Venezuela, on 8 March 2008 the first shipment of oil was received. Honduras became the 17th member of the alliance in December 2007, under President Manuel Zelaya but left the organization after the 2009 coup d'état before rejoining it on May 2012. Belize set up the Belize Petroleum Energy Company to coordinate for the project. ^ a b c d "Google Translate". Translate.google.com. Retrieved 26 August 2018. ^ "PetroCaribe: Chávez's Venturesome Solution to the Caribbean Oil Crisis". Venezuelananalysis.com. 31 January 2006. Retrieved 26 August 2018. ^ Kim Ives (7 June 2011). "How Washington and Big Oil Fought PetroCaribe in Haiti". Haïti Liberté. 4 (46). Retrieved 24 March 2019. ^ "Oil Industry Professionals, Trading, Risk Management & Treasury, Settlement & Compliance - Platts". 4 June 2011. Archived from the original on 4 June 2011. Retrieved 26 August 2018. ^ a b c "BBCCaribbean.com - News - Barbados will not sign Petrocaribe". Bbc.co.uk. Retrieved 26 August 2018. This page was last edited on 24 March 2019, at 03:29 (UTC).